Red fox are the most adaptable and have adjusted to living compatibly with us. Foxes of three species—red, gray, and kit—find food, shelter, and even places to den and raise their young among us in towns and cities. Which species you are most likely to have in your neighborhood depends upon your location and surrounding habitat. Red foxes are the most adaptable and widespread. For the most part, foxes live compatibly with us and maybe just under our noses, adjusting their active times to minimize overlap with ours. 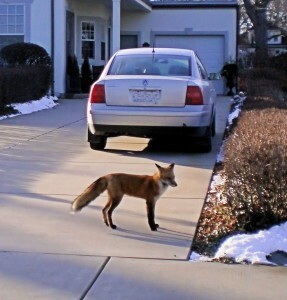 Any potential conflicts with foxes can be easily prevented or resolved. Because of their beauty and intelligence, most people are excited to catch even a glimpse of a fox. Read on to learn what researchers have discovered about these secretive and alluring animals. Foxes use a wide range of natural habitats, but wherever they live, they establish multiple dens throughout their territory. Sometimes a fox may enlarge or modify a den abandoned by a woodchuck, badger, or other ground denning animal. Other times a fox may establish a new den in a carefully selected spot—perhaps even under a deck, porch, or outbuilding. As you’d expect, they use dens for cover, resting, and raising their kits. After several weeks of staying inside the den, kits begin to play outside its entrance. During their tussles, they trample vegetation and scatter the carcasses and scraps that mom has brought to them, making their entrance more evident, but by this time, they are nearly ready to move along. Fox dens may have long entrance tunnels, and they usually have escape holes to use in case a predator enters. Nutria may be part of the diet of fox living in one of the eighteen states where nutria are found. Foxes also do some digging to store food throughout their territory. These small, carefully covered caches are remembered so the fox can return to them when other food is scarce. Thanks to a popular song, everyone now knows the answer if asked, “What does the fox say?” But you may be wondering, “What does the fox eat?” Well, their menu is actually quite vast, including countless natural and human-made foods. They primarily hunt small rodents such as mice, rats, and voles, as well as small mammals like squirrels, pocket gophers, and rabbits. They also eat fruits, vegetables, and nuts (found naturally or in gardens), as well as carrion, insects, snakes and frogs. Accessible gardens, poorly managed trash and compost piles, as well as pet food left outdoors, can also make a meal—something worth keeping in mind if you prefer not to have them in your yard. Foxes are on the prowl for vittles mostly between dusk and dawn, but when they’re feeding young, they may be out searching for food at any time of day. Foxes don’t tolerate one another well. Among the family, though, it’s another story. Fox moms and dads and even older siblings are involved with providing for the young and playing with them. Through step-wise learning experiences, they cultivate their kits’ hunting skills. At first, they bring back prey they have already killed and then injured prey animals, giving the kits a chance to hone their skills with a slow-moving target. Soon, more lively prey is delivered. Next, kits are brought along on hunts to learn the full process. Eventually, they’re ready to try out their own paws and new skills at hunting food on their own. 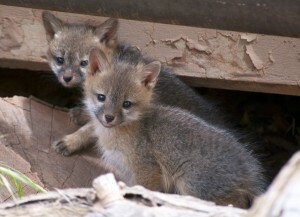 Once old enough, these gray fox kits will be brought along on hunts to learn to hunt for themselves. Kits are also taught how to avoid becoming prey themselves. Foxes can usually outrun domestic dogs, wolves, and coyotes, and they use the tactic of dodging and weaving when trying to escape especially fleet-footed predators. They’re also excellent swimmers, and the grey fox can even climb trees. 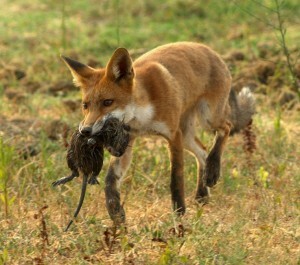 Still, of course, foxes are sometimes on the short end of the predator-prey stick. Among their common predators are golden eagles, cougars, bobcats, and lynx. Foxes are also hunted by some humans, and some are also needlessly killed by humans who perceive them a nuisance. This type of response to the presence of a fox is an overreaction, though, as foxes are not aggressive toward humans and will usually retreat, or leave an area entirely, with mild harassment.